Ras-Al-Khaimah may not be an oil rich emirate (it only owns 0.1% of the total UAE oil reserves), but it is often refered to as the most fertile. Containing desert and mountain landscapes, fertile plains with date palms and vegetable gardens, as well as a coastline with natural creeks that shelter mangrove forests, it is hard to believe that it only makes up 2.2% of the total landmass of the UAE. The Hajar mountains that start in the Musandam Peninsula, on the northernmost tip of the Arabian Peninsula, and run all the way south to Sur in Oman, cut through the emirate and imbue it with a rugged beauty. Ras-Al-Khaimah translates as “the top of the tent”. The story, myth or truth, goes that the ruling sheikh used to pitch his tent on a point of land that was elevated above the seashore that could easily be spotted by passing ships. Most of the beauty of this land is contained in its colourful stories. Archaeology tells of ancient civilisations that have flourished here for thousands of years, while the imagination fills in the gaps. Modern day stories take on a different slant, as the region fills up with people from all over the globe, bringing their cultures and beliefs with them. 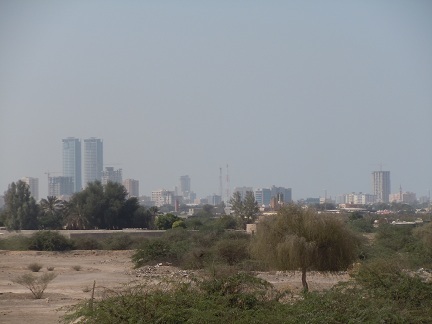 Ras-Al-Khaimah is home to about 260 000 people of which almost half are local Emiratis. This gives the region a strong local flavour that distinguishes it from the rest of the UAE where the Emiratis make up less than 20% of the total population. Most foreign-born workers here come from other Arab countries, India, Pakistan, Bangladesh, Iran, Afghanistan and Southeast Asia. It is not only physical features that distinguish people from one another, but also the physical attire they clothe themselves in that speak of faraway homelands and specific values. In this diversity lies a beauty that enhances daily life. Long before the discovery of oil the inhabitants of the region earned a living from the sea. The Arabian Gulf was known for its pearls, and every summer boats would leave for the pearl banks to harvest a meagre living for some, and wealth for others. This hard life, but only means of income for many came to an abrupt end in the 1930s when the Japanese started cultivating freshwater pearls, and the world suffered economic turmoil. Pearl farming has returned to the UAE through a joint venture between RAK and the Japanese in the form of a small pearl farm in Rams, just north of RAK City. For centuries Julfar, the predecessor of Ras-Al-Khaimah has flourished and prospered at the crossroads of the trade routes that have linked Europe with India, China and Africa. Modern wealth is created by the industries of the emirate. Ras-Al-Khaimah Ceramics that started producing wall and floor tiles in 1991 has become one of the world’s largest producers of ceramics, and its products are being exported to about 120 countries, while Julphar Gulf Pharmaceuticals export most of its products. Other industries like the quarrying of high-quality limestone and the production of cement are a direct result of the bounty the Hajar Mountains have to offer. There is huge potential for tourism in the area, and although the occasional tourist does pass through, it is a pity that most are so seduced by the glitter of Dubai, that they overlook the rich diversity, history and stories of an emirate whose name most have never heard of. Interesting to read Your stories.